Togaidh BPA nan Eilean Siar, Alasdair Allan, ceist le Calmac air carson a thathas a' toirt an t-soithich an MV Hebrides gu slighean eile grunn sheachdainean tron Gheamhradh. 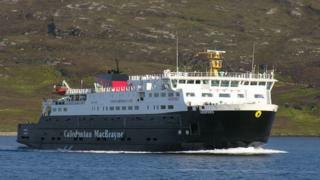 Tha an MV Isle of Arran agus an MV Hebridean Isles a' frithealadh na slighe eadar Ùige, Loch nam Madadh agus an Tairbeart an-dràsta, ach tha aiseagan air an cur dheth agus air an atharrachadh tric is minig. Choinnich Mgr Allan ri grunn luchd-gnothachais ann an Uibhist, an dèidh dhaibh dragh a thogail mun t-suidheachadh air na meadhanan sòisealta. "Am puing as motha a bh' air a thogail an-diugh agus an-dè ann an Uibhist, a' bruidhinn ri daoine, 's e sin an t-seirbheis a th' air a bhith ann anns a' Gheamhradh," thuirt Mgr Allan. "Tha a h-uile duine a' tuigsinn carson nach biodh bàt-aiseig a' seòladh nuair a tha droch shìde ann. "Ach a' cheist as motha a th' aig a' chuid as motha de dhaoine, 's e sin dè am bàta a th' air a chleachdadh sa Gheamhradh bho Loch nam Madadh, agus a' cheist a bh' aig daoine 's e sin carson nach robh am bàta abhaisteach, an Hebrides, air a chleachdadh airson a' chuid as motha den Gheamhradh?" thuirt e.
Tha an MV Hebrides air a bhith air falbh bhon t-slighe fad ochd seachdainnean air a' Gheamhradh seo thuige seo. "Tha daoine a' tuigsinn gum feum na bàtaichean a dhol gu doca tioram a h-uile bliadhna airson cola-deug no trì seachdainnean," thuirt Mgr Allan. "Ach bha an Hebrides air a cleachdadh ann an àiteachan eile airson faochaidh, ann an Eilean Arainn mar eisimpleir, agus bha bàtaichean eile, MV Isle of Arran, a' tighinn gu Loch nam Madadh. "'A cheist a bh' agamsa, 's e sin an robh sin a' toirt buaidh air an t-seirbheis a bh' ann eadar Loch nam Madadh agus Ùige?" thuirt e.
Tha Cal Mac ag ràdh gu bheil àm na h-obrach-càraidh na dhùbhlan gach bliadhna. Thuirt iad gum feum iad cuid de shoithichean a thoirt far nan slighean àbhaisteach, ach gum bi iad a' dèanamh an dìcheall gus an ùine airson seo a chumail cho goirid 's a ghabhas. Tha iad ag ràdh gu bheil iad ag aithneachadh nach eil e freagarrach ach gu bheil na roghainnean a th' aca air an cuingealachadh.